This past year has been more than interesting for the Republican Party in a variety of ways. A major reoccurring theme among conservatives has been that of party identity. Tea Partiers have stirred up the issue of party identity and triggered a spark in the debate of a two-party political system. After a successful launch of Tea Parties across the nation last spring, there has been talk about creating an official Tea Party — a political third party separate from the Republican Party with its own candidates and platform. While the Tea Party movement rendered successful and perked up the government’s ears, splitting up conservatives because of issues with a party as an institution is just that: splitting the conservative vote. While I’m a pro-life card-carrying member of the NRA, there are definitely some things about the Republican Party platform I don’t agree with whether it be because of my age, hometown, or the fact that I’m a college student. There are times when I agree more with the Tea Party movement or another third party platform. However, I would never, in a million years, vote for a third party candidate over someone running under the Republican Party regardless of how similar his or her beliefs are to mine. Don’t get me wrong; I wholeheartedly support everything the Tea Parties are doing apart from starting a third party. (I even helped organize and speak at a Tea Party last year!) But while I think everything the Tea Parties stand for and are responsible for is great, supporting and voting for a third party candidate will only hinder the progress the Republican Party has made this past year (and will continue to make come this November). While I may not always completely agree with the Republican Party platform, I will always support it 100 percent. Picking and choosing minor issues to base one’s vote for a third party on just takes a vote away from a Republican candidate that has a far better chance to win an election over a third party candidate. Our nation has a long history of a bipartisan government, and unfortunately, I doubt a sudden influx of Tea Partiers will change this. At such a tumultuous time in our nation’s history, I will not let my vote be wasted over a minor platform discrepancy. Some third party-supporting Tea Partiers can argue and say that the Republican Party has become an institutional bureaucracy, and I will agree and say that, at times, it most definitely seems that way. But when was the last time you saw a third party candidate take office? So what if I’m an “institutional” Republican? With all due respect, a third party sure ain’t going to take back Washington in November. Tea Partiers: Continue to rally for less government intrusion in our lives. Your efforts are being noticed in Washington. But don't break away from a party with the same goals and beliefs as you. Continue to hold the GOP accountable and you will see positive changes take effect. Your enthusiasm holds the key to pushing our country back in the right direction, but only if we all work together towards a common goal. To those that fall in the middle of the political platform cracks like I do sometimes, give your vote to a candidate that will support our Constitution's promises of life, liberty, and the pursuit of happiness. Give your vote to the candidate that will have the influence and will-power to get things done in Washington. 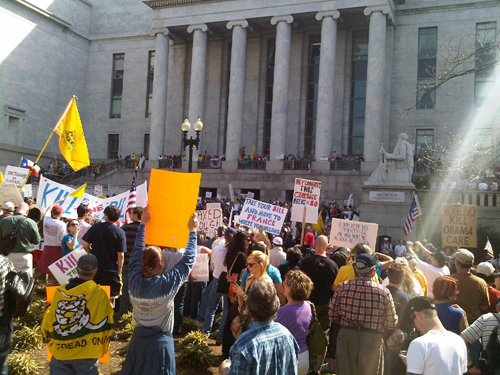 "Tea Partiers: Continue to rally for less government intrusion in our lives. Your efforts are being noticed in Washington. But don't break away from a party with the same goals and beliefs as you. Continue to hold the GOP accountable and you will see positive changes take effect. Your enthusiasm holds the key to pushing our country back in the right direction, but only if we all work together towards a common goal." I have to disagree with this one... There is no way I can, in good conscience, vote for Rick Perry. I could give you countless reasons, but let's just say that Rick Perry has championed for his back-room-deal buddies and not the people of Texas. (as I said, I could list a multitude of reasons, but you already know them) Maybe we will have to have results in Texas like those of the NY race in order for the GOP to get back to conservative principles and nominating decent candidates, but regardless of how it ends, voting the party line is partly responsible for the mess we currently find ourselves in. Gov Rick Perry is the only one who can keep Texas doing as well as it is. He has done a good job for Texans. We MUST rally behind him and make sure we keep him in the Governor's seat. Voting for a 3rd party candidate will only serve to put Bill White in. Is that what the medina/Ron Paul people want? There are those who say will will vote FOR Bill White for governor, to "punish" Governor Perry. It won't punish Gov Perry, it WILL punish Texas and her citizens for many years to come. This site appears to have a huge Rick Perry bias. Overlooking his continuing support of the Trans Texas Corridor, albeit with a different name, his son's relationship to the foreign company he would have given 50 years of TTC revenues too, and his lack of any real action on Obammacare. Never is any mention made of the appearance of budget deficit under his watch. Trying to say White was insulting the military and ranchers because of a statement about Rick's lack of private sector experience was journalistic distortion at best. To try to to list Rick's Air Force Service as public sector experience makes me question all objectivity. It is sad that White would be even worse for Texas than Rick, but stop glorifying "the lesser of two evils." I bet this group thinks Sarsah Palin is a real Liberty-loving Patriot as well. Please, some of us are not Neocons.